I've been pretty busy the last month or so at work, and also prepping for an upcoming solo show at the Studio Gallery in San Francisco. Between framing, and also working some weekends for my 'day job' I began to run down the clock to get some studio pieces done for the show, so I ended up withdrawing from the Sonoma Plein Air event, which I have participated in pretty regularly over the last 10 years, in order to free up a weekend to work. At any rate, I was able to finish a few studio pieces, which for me was a minor triumph, as I am still trying to find a balance with that work, between nature, invention, memory, and reference. These two pieces were based on studies I had done this summer, and I believe can be seen in some previous posts. This is from a view across Lake Ediza from our campsite in August. I had abandoned chasing elusive sunrise colors hitting the peaks in favor of sipping a cup of coffee at 6:20, and watching the light roll down the cliffs like a window shade, moving from brick red, through crimson, orange, and yellow. I tried different views each morning, once the light settled down, and picked this one to explore further at a larger scale, in the static and contemplative studio environment. 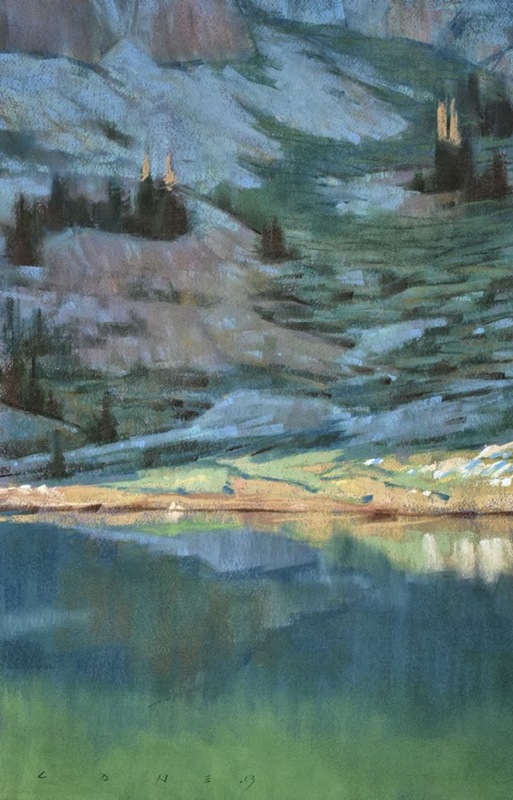 The original study was about 6 x 9, and I felt I could take it larger, and still have elements to refine and play with. I do fully realize that my idea of 'large' is someone else's 'small'. I painted a few studies from this spot during a workshop in July. The location is in a gorge right below a Pacific Crest Trail footbridge that crosses over the Yuba river, a few miles below Bassett's Station in the Sierra Buttes region. 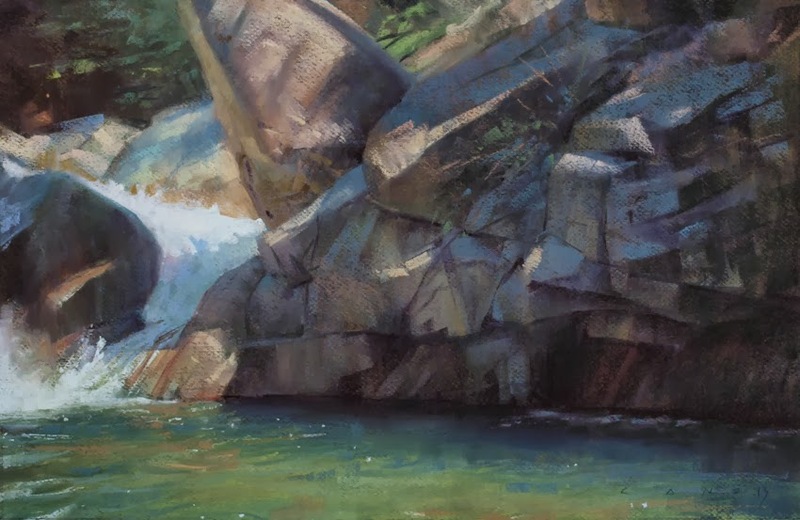 It is a great spot to paint on a hot summer day, as one can go swimming afterwards, or just keep moving around in the shade and painting different views of rocks and water. While I was here with my class, painting away, several groups came down to swim in this area, jumping off of rocks, and whooping away. What first seemed to be a remote and peaceful spot, suddenly was transformed into 'the old swimming hole' for the locals, as well as the overheated artists, and the odd, bearded, 'through-hiker' that stripped to his american flag boxers and partook of the soothing waters amidst the menagerie of painters and whooping, pot smoking teenagers. I am convinced one can go into the studio, armed with the outdoors experience, the studies at hand, the photo reference, and get something that can surpass the work done solely in the field. My show opens tomorrow, and the reception is this Sunday, October 6th, from 2-6. I'll be there, and I'll also be giving a talk next week at the gallery, on a Thursday evening, the 10th at 7 pm. If you're in the neighborhood, come on down.